If you change your profile photo, URL, or campaign titles/names, then you might have trouble sharing your page on Facebook and social media. When shared on Facebook, it will show the old information or picture because Facebook caches the old data. You will also need to follow these instructions if you see the following error when you try to share your page on Facebook. That’s it! When you share your page, you should now have the most updated information. 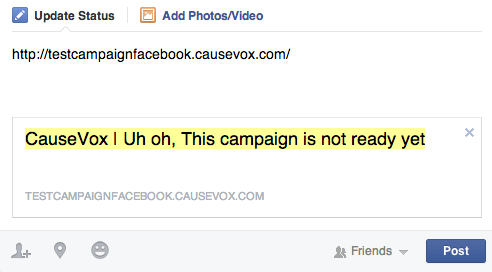 **Note: Please use an image that is at least 600px x 315px for Facebook sharing in CauseVox.